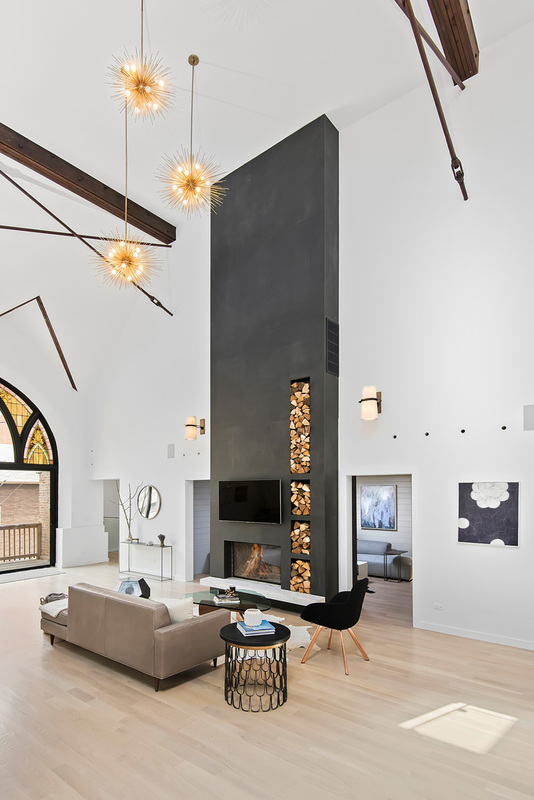 A beautiful home that was once a church that retained the historical features of the structure. 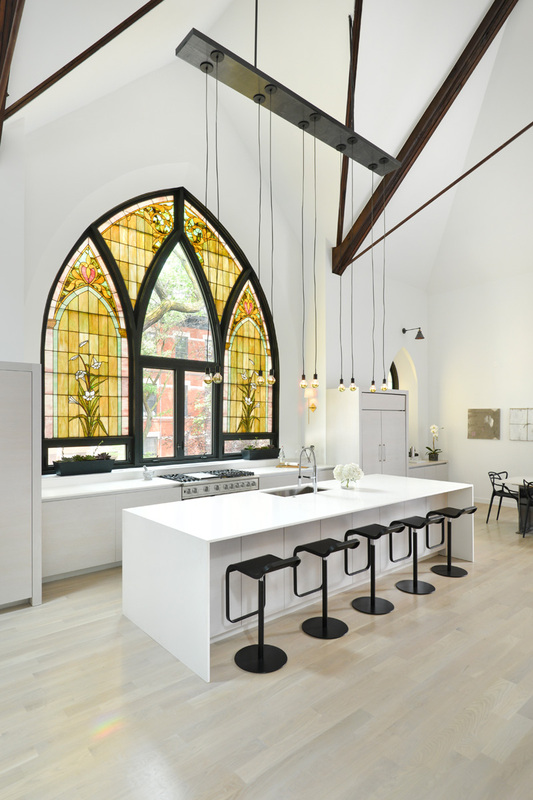 There are many churches that were already converted into a home. I actually find this impressive because the architecture of a church is very different from that of a home. But it sure is sturdy and would have high ceilings which mean that you can add a mezzanine into it. Church conversions had been a trend these days which is actually a better idea than to totally demolish a church. And the designs of the homes inside a church are all very beautiful! 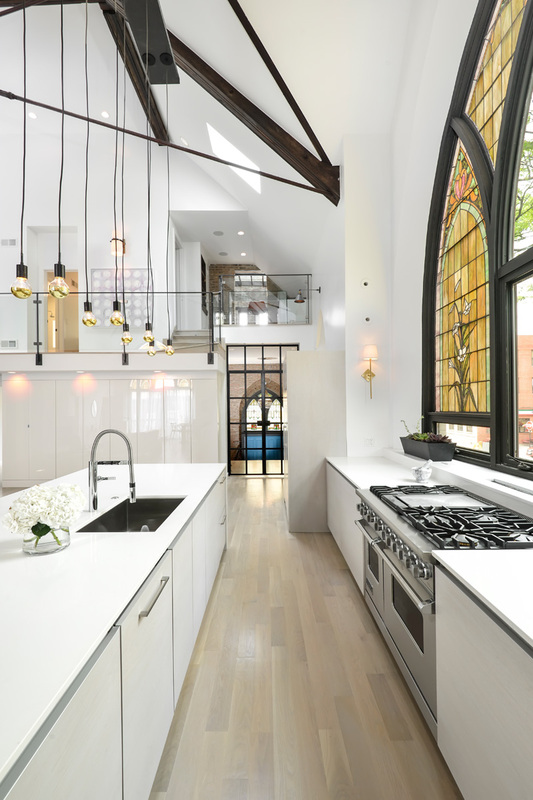 I can say that because we have already featured some church conversions before too and I am really amazed of what the designers did to the homes. 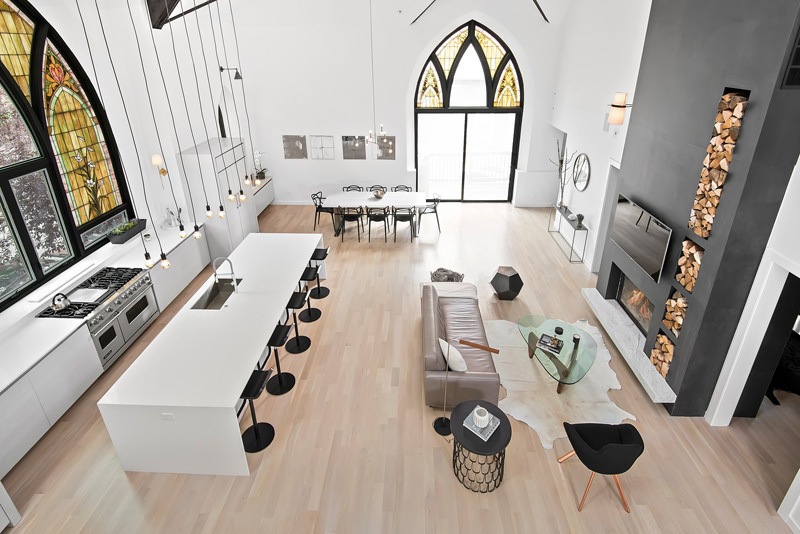 Unique feature: A church was converted into a house featuring a mezzanine, bedrooms and everything a family needs for a home. While integrating modern features, the historical details of the church are retained in the structure. Similar House: Dutch Church Loft Residence in Netherlands: From a Church to a Home! The house has tall ceilings which are expected for a church. Notice the color palette used here as well the lightings too. 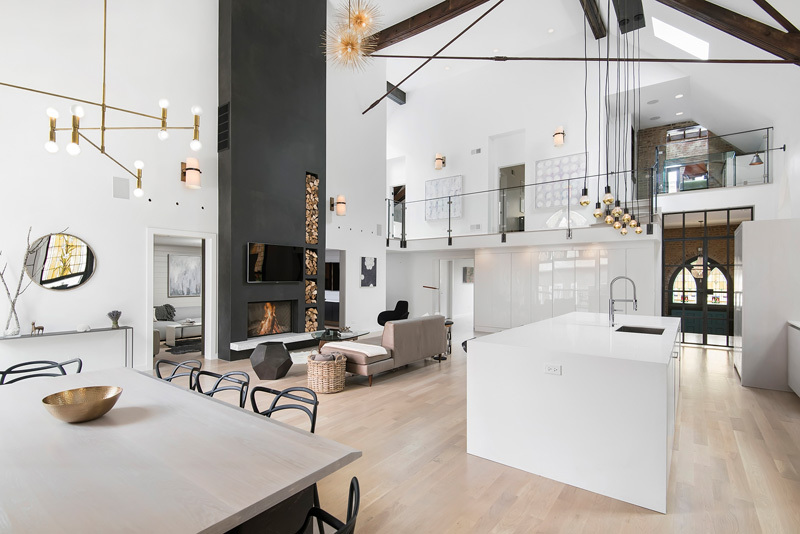 A fireplace stands from the floor to the ceiling and it has a mezzanine. One of the obvious details that will tell you that it is indeed a church is the design of the windows and the stained glass. But these features bring more appeal to the house. Using white made it look even more larger. The fireplace is one feature in the house which is a head turner and you would surely notice it because it towers from the floor to the ceiling. Firewood is stored on the sides of the fireplace which actually seems to be an added decor too. Love the furniture here especially the golden accents. 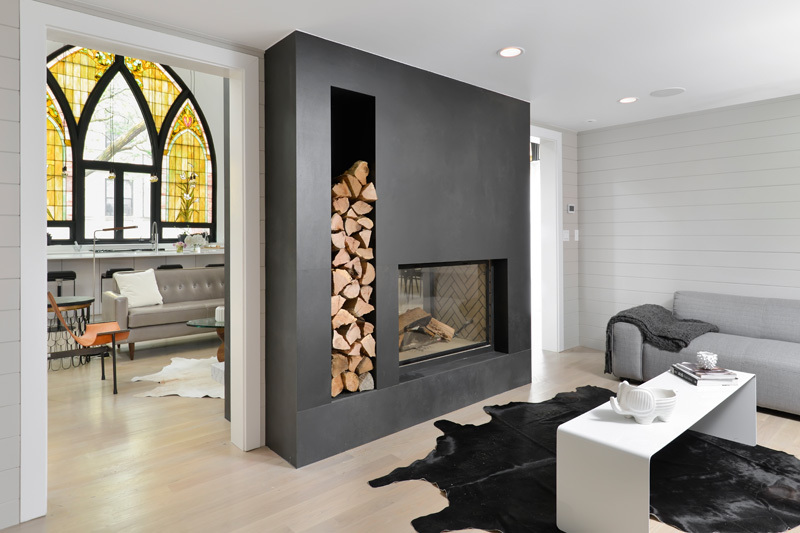 In a smaller room, a similar fireplace is seen in it with the same color palette as the rest of the room. Notice here the black cowhide that is in contrast with the white furniture. 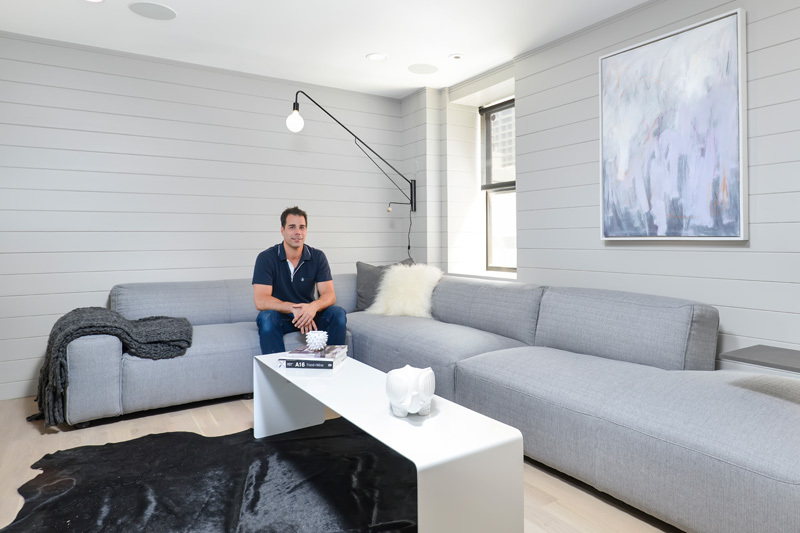 A better view of the room where we can see an industrial lighting and the light gray sofa that has a similar color with the walls. The kitchen is on the same floor area of the living room. It is also white in color with some bulbs suspended from the ceiling. That window is very beautiful indeed! Under the kitchen islands are storage spaces for the kitchen. It used modern fixtures and equipments which fit to the modern lifestyle of the family. Take a look at that gorgeous wall sconce on the wall! Vintage and rustic looking wall decors are seen in the walls of the dining area. 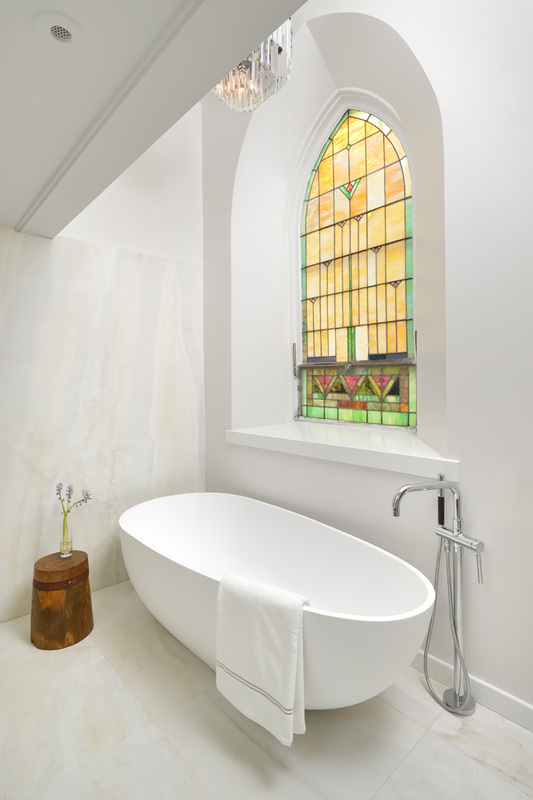 The stained glass window here has a different design but is a feature that unites the look of the entire space. Black and white dining set is being utilized in the area. Stained glass windows are also seen in the bedroom. The middle window used plain glass to let more light into the space. The master’s bedroom has the same color scheme as the rest of the house. Like the bedroom, this one also has stained glass window. And it is all white in colors with a white tub too. The flooring is made from ceramic tiles that creates a neat look in the space. This bedroom for the kid has some pops of orange in it. I like that hanging chair as well as the loft play area. And of course, the wallpaper has a huge impact to the look of the entire space. 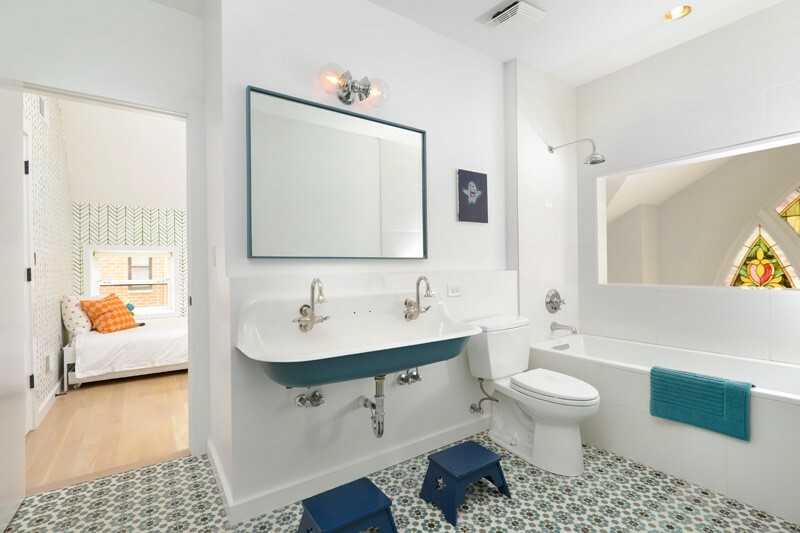 The bedroom has its own bathroom with floral ceramic flooring. Blue and white are the colors seen here. The kids have an interesting bedroom which shows their inclination to mountain climbing. It has gray covers for the bed and its own bathroom. 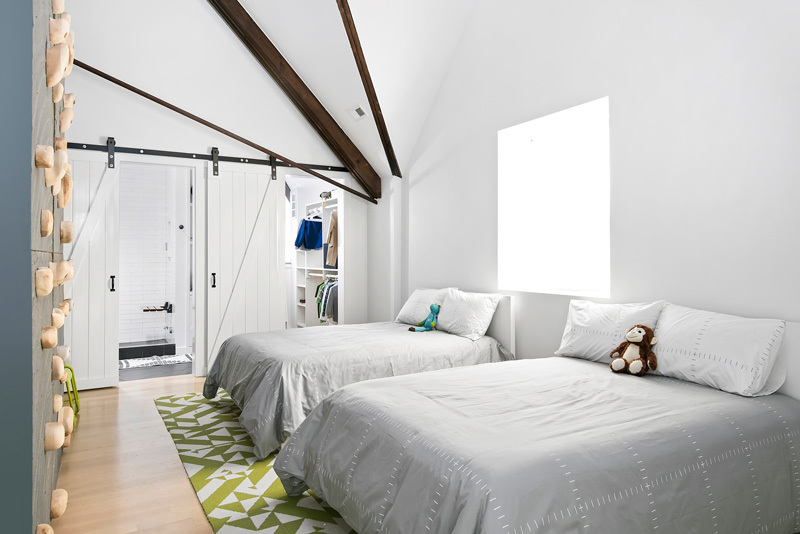 You can see here the exposed beams as well that looks nice with the white paint in the walls and ceilings. Pops of green are seen in the bedroom which is a good match to its white and gray color palette. Notice the barn door too as well as that climbing wall. They can immediately start climbing when they wake up! One interesting feature of the house is this climbing wall and that geometric design of the wallpaper. It would be fun to do some climbing in your own house, agree? I know you’ll nod on this! That wall is indeed very creative! It is covered with fabric that looked nice with the hexagons on the flooring. Such a beautiful small bathroom area indeed! I like the brass fixtures used here too. This bathroom has black and white colors and a hive-style flooring for the shower area. 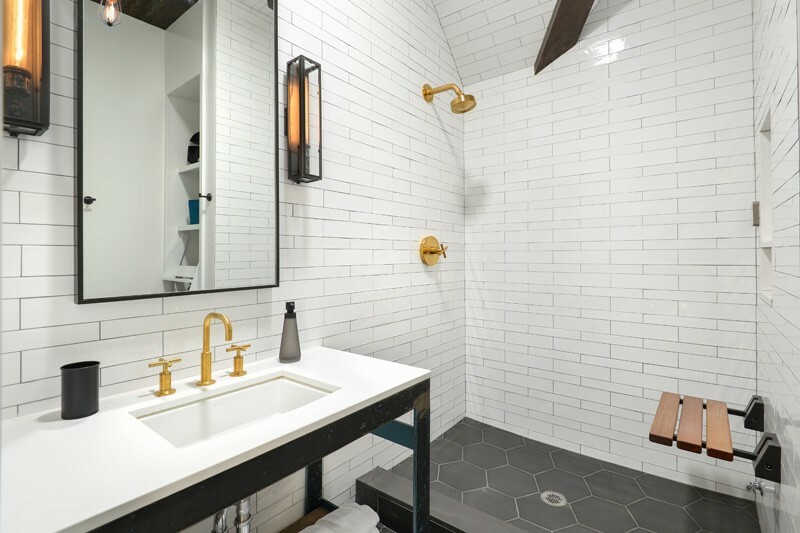 The golden fixtures like the faucet and the shower add some glam to the space. So what can you say of this new look of a church? Very impressive indeed! 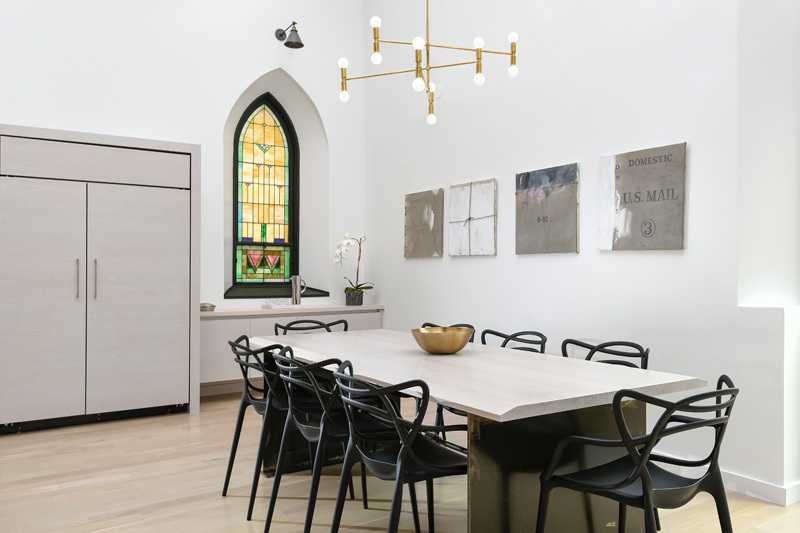 You wouldn’t expect that a church can actually be turned into a home like what Linc Thelen Design and Scrafano Architects did to this structure. In fact, you wouldn’t think that you are inside a church because of the design in it. Its use of contrasting black and white with the golden accents is all beautiful and would create a lovely space to live in. There is that subtle industrial feel in the house too that look very nice. All in all, the interior looked very cozy! I like what they did to this church especially when they retained the stain glass windows.